NASHVILLE, TN — Sixteen-year-old patient Chip Crabb came into Dr. Linda Brady’s office in August of 2017 with symptoms of what appeared to be a cold. But as the weeks progressed and Chip’s illness worsened, Brady knew something was wrong, running tests and referring him to high caliber doctors to get to the root of the problem. It was this instinct that led to the discovery that Chip had a rare autoimmune disease known as GPA vasculitis. 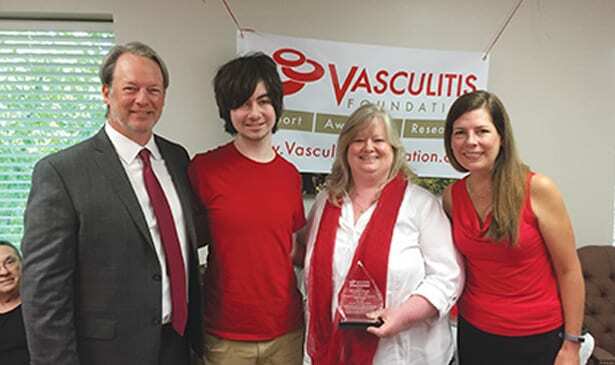 Brady, Chip’s longtime primary care doctor at Old Harding Pediatrics Associates, was honored for her critical diagnosis with the prestigious V-RED Award from the Vasculitis Foundation, which she was nominated for by Chip’s mother, Lisa Crabb. “Dr. Brady pushed forward, even though she wasn’t sure what she was looking at. She kept calling the different specialists for the different tests to figure out what was going on with Chip,” praised Crabb. Brady made a crucial decision when she sent Chip to pediatric pulmonology at Monroe Carell Jr. Children’s Hospital at Vanderbilt where they officially received the vasculitis diagnosis, a moment Crabb calls “terrifying.” “Here we have this healthy 16-year-old and all of a sudden we’re being told that he has a life-threatening illness,” she recalls. Days before Chip was scheduled to start chemotherapy, the Crabbs received a life-changing phone call from Dr. Eveline Wu at the University of North Carolina at Chapel Hill, informing them that UNC is a pioneer in the treatment for vasculitis and wanted to partner with Vanderbilt to help heal Chip. Weeks later, the family traveled to UNC Medical Center where Dr. Ronald Falk, who co-founded a treatment for GPA vasculitis in 1975, helped administer the treatment that sent him into remission. Crabb attributes Brady’s swift course of action in getting Chip to the right specialists as the catalyst that led to life-saving treatment. “She ultimately saved Chip’s life by following her instincts. She really proved that she was compassionate and there for us and was going to do what we needed to do and find what we needed to find until we found it. And she did,” described Crabb. Following her son’s diagnosis, Crabb became a member of the Vasculitis Foundation where she learned about the esteemed V-RED Award in the monthly newsletter. Crabb took it upon herself to write a letter to the foundation nominating Brady for the award, which she was chosen for over 41 other medical professionals from across the world. Crabb says Brady was “very worthy” of the award, accomplishing an exceptional feat as a pediatrician who helped identify the disease.